Eliminate even the toughest cat urine odor and stains. Nature’s Miracle® Just for Cats Advanced Stain and Odor Remover is strong enough for your cat’s worst messes—even those that are old and set-in– and is specifically formulated by Nature’s Miracle to target cat-related incidents. Our formula removes severe and stubborn organic stains and odors—including overlooked accidents, spraying, hairball messes, deep-set dirt and grass, food, vomit, blood, and more. 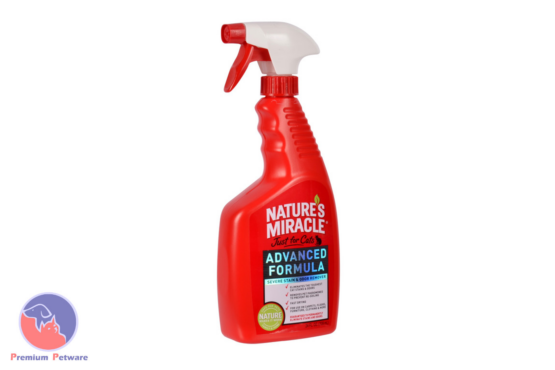 Nature’s Miracle® Just for Cats Advanced Stain and Odor Remover’s superior, oxygen enriched, bio-enzymatic cleaning capabilities make it one of the best performing, cat-specific formulas in the pet industry. Our advanced formula may be used for stubborn stains and odors caused by cats on carpets, hard surfaces, clothing, kennels, carriers, and litter boxes. Nature’s Miracle® Just for Cats Advanced Stain and Odor Remover works quickly to get at the source of even the most stubborn stains and odors by actually surrounding organic stain and odor matter. Our bio-enzymatic formula breaks down and works to eliminate stain and odors rather than masking them as other products may do. Nature’s Miracle® Just for Cats Advanced Stain and Odor Remover works best when allowed to dry naturally (sometimes taking up to two weeks) and it is especially important that the product reach all of the affected areas—including carpet pads and subfloors where stains and odors can spread far beyond what is visible.